While you are being told that Victoria has a growth rate of 2.4, of which 60% is due to overseas immigration, and a dangerous shortage of infrastructure, you will not be invited to question these immigration numbers. If you do, you will be told that immigration numbers are the province of the Federal government and the States cannot do much about it. Since the 1990s this has been untrue. The states tell the Federal government how many immigrants they want. The states also manage land and water, and have land-production departments/corporate entities, associated with political parties and lobbies. Huge amounts of money change hands. No-one knows where it all goes. 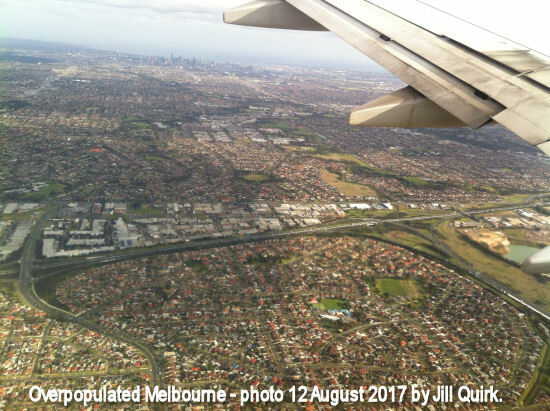 If our politicians really wanted to reduce the pressure and hardship in Australia, they would tell prospective economic immigrants that we have a population growth problem, end sponsorship and reduce immigration. That they do not do this shows that they are working for the property investment lobby and against ordinary wage justice, not for most Australians. Refugee numbers need not be affected. "Melbourne is not The most liveable city in the world because governments are not accepting responsibility for the impact of an unsustainable population growth rate.Victoria's underemployment rate is at a record high of 9.5%; a key measure of economic health. Growth needs to be moderated to better reflect the capacity of the state's economy". My correspondent received a prompt phone call from the Minister's Office to say that he was NOT allowed to raise this question at the morning tea. I am amazed at the arrogance of the people who have taken over power here. But at least people can see it on candobetter.net. Wonder what questions the Minister Luke Donnellan will allow to be raised? What a dishonest invitation he has issued.